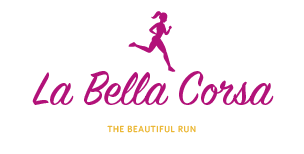 Welcome to LaBellaCorsa, “The Beautiful Run”. I too used to be one of those women, busy with 2 kids, a career and family to organize. The thought of putting on my running shoes and heading out the door seemed not only intimidating but pure drudgery. That is ,until I caught a vision of what running could be for me…..a thirty something mom,, who was not in shape, with time constraints and a life that needed my time and attention. I started just running inside on a treadmill trying to stay motivated with just some tunes on my iphone and the hopes of getting in shape…..this was getting boring very quickly. Then I found the registration for the Niagara Falls Women’s ½ marathon webpage . It was February and the thought of running 21.1km by June seemed almost impossible! However, it was then that I met my fearless running partner. She had already run a ½ marathon and I convinced her to train and run this race with me. This partnership was the turning point for me and my passion. We dutifully met weekly outside to do our training runs, week by week increasing our mileage. I was doing it, I was really doing it! Gradually I was getting in shape and feeling good – albeit stiff after every long run!! When we finally got to the race in Niagara Falls , standing in that starting corral I was overcome with tears of pride. Not the puffy head pride like “I’m better that you” , but the personal pride in myself that I had set a goal that was almost impossible for me at the time and had run my legs off to achieve it. I didn't care how long it took me to complete that race, I had won in my mind for just having the courage to train and show up! The race was windy and cold and we ran hard, finishing together with hour arms raised high as we crossed the finish line! The “runner’s high” that I experienced that day after that first race was almost beyond words. I had accomplished something just for me, and I was proud of myself. As a mom, I’m often encouraging my kids and being proud of them. Supporting my husband and my family to be their best. But it had been a long time since I had done something purely for me, that I could say I worked hard, I earned this and I feel great! Since that race I haven’t stopped running. I run races to PR, I run races just to see the race course (DisneyWorld ½) and I run all winter outside, just because I enjoy the challenge and the scenery. Running for me has become a passion, but not because I’m an elite runner, placing or winning medals in my age category. I’m passionate about this sport because it has made me a better person. The complexity of putting on shoes and running is, as any runner will tell you, more between the ears than just logging the miles. Running is organic in its nature but it takes courage, commitment and willpower. If you let it, however, it can be transformative. Most women can run, given support, time, encouragement and training. I hope that I can be a cheerleader, a training partner and an enthusiastic guide to help women find their place in this growing sport. Women, especially moms, need to be healthy. Not just for themselves but also for the ones who depend on them.So why running????? Running is efficient , I run 2x per week for 30min then a long run on the weekends. I don't have time to spend hours at a gym or on exercise equipment. Running is portable, I can run anywhere – last year I ran in Whistler, B.C on holidays and got lost….but I’ll save that story for another bog post about planning your routes wisely!!! Running can be social, my training partner and I literally talk for hours as we run 18,20, 24km! Running for me is fun and I hope I can make it fun for other women and moms.